Some companies will sell you an ionizer regardless of your water quality situation. IonWays has drafted the following information and guidelines to help you understand the role water quality plays in ionizer performance and longevity. From this perspective, you will be better able to make an informed investment in an ionizer and your health. Most people think water is just plain old H2O and is the same regardless of where it comes from - whether from a bottle, tap or well. The truth is water quality varies widely throughout North America and this variation has a significant impact on the performance and longevity of your ionizer. The variation in water depends on many factors. There are two basic causes of variation - natural environmental factors and contaminants caused by man. Contaminants are usually man-made, but not in all cases, as there are also naturally occurring contaminants. A main influence on the type and concentration of contaminants is how close the water is to population centers, industry, livestock and/or agricultural operations etc. Natural causes of changes in water quality are mainly due to the source of the water supply. Some examples of common water sources are aquifers, rivers, reservoirs, run-off, wells, springs etc. These variations in source contribute to the difference of the mineral content in water. These variables cause water to have very different properties, such as taste and smell or to "behave" or perform differently around the house, especially in an ionizing unit. As the popularity of ionizers continues to dramatically expand, we at IonWays are gaining experience in dealing with the wide variability of water quality. IonWays is committed to work with our customers to provide the solutions required before and after the sale. 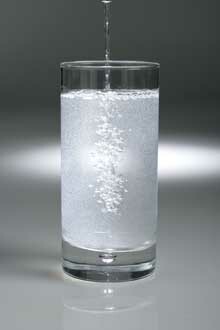 One dramatic variation in water found across the US is the mineral content. Depending upon the geological conditions, the source of water (groundwater/wells or surface water/rivers & lakes) and other factors, the amount of minerals found in water differ significantly. The variability in mineral content is described as "hard" or "soft" waters. Hard water has a high concentration of minerals. Soft water is low in mineral content. that leave insoluble mineral deposits. Hard water mineral deposits or "scaling", is the precipitation of minerals which form lime scale. Scale can clog pipes and can decrease the life of virtually all appliances in the home, especially those that use hot water. It can coat the inside of tea and coffee pots, and clog and ruin water heaters - and of course do the same thing to your ionizer decreasing performance and longevity caused by the build up of scale on the plates inside the ionization chamber and internal tubing. As scale builds up inside the chamber, the strength of ionization is diminished. 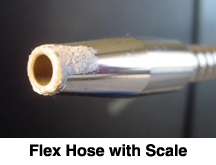 Clogged tubing can lead to decreased water flow. Very soft water (which is acidic) can corrode the metal pipes in which it is carried and as a result the water may contain elevated levels of cadmium, copper, lead and zinc. An ionizer requires mineral content to operate. It is the minerals which carry the electrical charge that produces the alterations found in ionized water. Water that has little or no minerals, such as reverse osmosis or distilled water has no pathway for the electrolysis or "ionization" to occur. It is important to note that all water found in nature has dissolved mineral content, so these types of "pure" water are a man-made phenomenon. Our bodies are made to drink water with minerals, not pure, mineral free bottled water. Calcium, potassium and magnesium minerals in natural water are called the "essential alkalizing minerals" as they are essential to our health. The more mineral content your water has, the more easily your ionizer will alter the water and the better performance measurements you see. The less mineral content, the harder it is for your ionizer to create alteration in your water and the weaker performance you will see. In simple terms an ionizer will perform better with mineral rich or hard water and will have a harder time with softer water, or water low in mineral content. Ionizers are designed to perform optimally within certain water quality parameters; too many minerals may damage any ionizer, too few you may experience decreased performance. 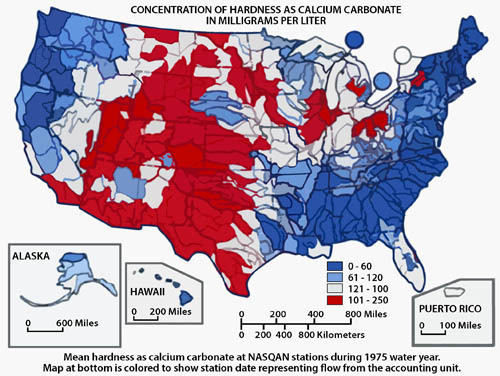 According to the United States Geological Survey, 85% of US homes have some level of hardness in the water. 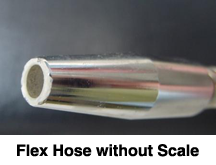 In most areas the level of hardness is acceptable for ionizers. The areas of US shown in red on the map below will generally have the highest levels of hardness. Ionizers will perform very well in most of these areas. However, be aware that there are isolated pockets in Arizona, Southern California, Texas, Utah, New Mexico and the mid west and in well water sources all over the US that have extreme hard water, which can cause ionizer malfunction and/or long term damage. Please see the "Water Quality Requirements" section below for specifics. NOTE: The above map is only to be used as an approximation and used to gain a general understanding of the water quality with respect to hardness of a given geographic area. The measurements in any area can be higher or lower, especially if you are on well water. The softest water occurs in parts of New England, South Atlantic-Gulf, Pacific Northwest, and Hawaii regions. It is important to note that these are generalities; you can find well water sources in soft water areas that have very hard water and conversely, you can find soft water in hard water areas. Source water in most areas of North America measures somewhere between the two extremes specified below, thus allowing for good ionizer performance and longevity. In cases of extreme water quality, contact your IonWays Associate first to inquire about possible solutions. If there is not an easy solution, IonWays Technical Support will always work with you to determine a course of action. Note: some reports will show "ppm" some will show "mg/l" - they are the same. Knowingly operating your ionizer above these levels may void your warranty and/or decrease your ionizer's performance. Hardness < 50ppm = Calcium Inserts or Remineralization Filter (different styles available). 51ppm < Hardness > 120ppm = New & Improved BioStone Plus Filter. depending on concentrations of other contaminants. 181ppm < Hardness > 250ppm = Spartan Ionizer Shield for Hard Water . 251ppm < Hardness > 425ppm = Water Softener + R/O System w/ Remineralizer. 426ppm < Hardness = Please contact IonWays Technical Support for additional information. In areas with extremely soft water (or if using a rainwater catchment system), it may not be possible to achieve optimal performance of your Ion Ways system. In this situation, a Remineralization Cartridge is recommended. IonWays has incorporated a proprietary blend of organic and inorganic minerals into its Remineralizer. In addition to measurements of water quality for ionization performance and longevity, health safety related issues are also important considerations when using well water. Well water tests can help to determine water quality; please refer to "The Well Water Memorandum" in your IonWays back office. Many states require a well water test report in the closing documents of a home sale. Many local governmental Health Agencies offer free testing of well water. We recommend contacting them first. Many municipal water systems have started using chloramines, rather than chlorine, in the water treatment process. The BioStone Filtration System, featuring a unique combination of media specifically designed for ultimate chlorine and chloramines filtration, is the best counter top filtration system on the market. Please contact your IonWays Associate if your water falls into any one of the above categories. If your situation requires additional technical assistance, IonWays Technical Support will work with you to find a solution. If your water is within 10% of two or more of the Extreme Hardness categories, you could possibly experience performance issues with your ionizer. You may require pretreatment. Please contact Technical Support for guidance. If you are uncertain of the water quality in your area, please contact your local water supplier and request the specific Water Quality information above. The appropriate phone number will be on your water bill. If using well water, contact your county or state health dept to inquire about water testing services.